Invigorate your courses with interactive virtual classrooms! Designed to help you spice up your online courses, our direct or LTI standard integrations allow you to bring the versatility of Adobe Connect to your online courses. You can enjoy the benefits of launching highly interactive virtual classrooms directly from your LMS interface! Have a different LMS? Our Adobe Connect LTI integrations can work with any LMS that is LTI compliant. Ask us about yours. Launch Adobe Connect from your LMS platform for powerful blended learning. Easily reuse or generate new profiles for your instructional needs. The full integration of Adobe Connect means you can record and review live sessions! Dive deeper into a topic with real face time in virtual classrooms. Encourage learners to collaborate with Adobe Connect Breakout Rooms. Allow learners to participate on the go – Adobe Connect is mobile compatible! Virtual classrooms make learning much more personal! Go beyond the chat board – use virtual classes to facilitate real conversations! Adobe Connect can be customized to address unique learner needs. Schedule virtual tutor sessions so learners can get more out of a course. Industry-leading audio quality helps improve online class sessions! 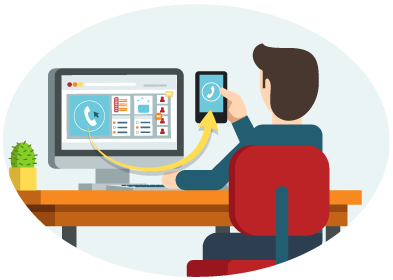 Avoid the VoIP hassle – users can dial in or be dialed out to by phone. Program audio settings from within your LMS. Advanced audio controls offer greater participant management. Ready to bring virtual classes to your LMS?